Meyer departs Ohio State with the program at an eerily similar crossroads thanks to his own retirement this week. Although Meyer is choosing to retire instead of being forced out, even he admitted that his three-game suspension at the start of the 2018 season after his mishandling of assistant coach Zach Smith played a part in stepping away. 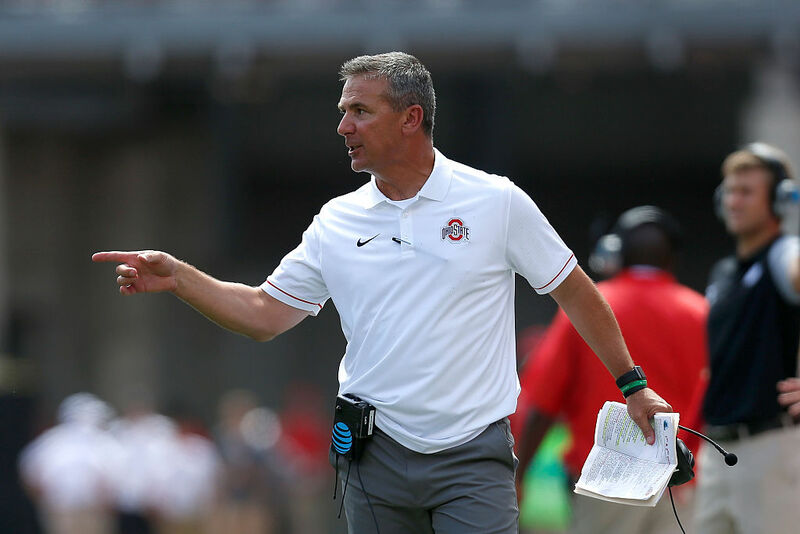 Meyer was heavily criticized for his actions and his sometimes tone-deaf response to the controversy that honestly never left OSU this season. After a campaign which saw Meyer face that fallout and additional health scares, it seems as if now is the right time for both he and Ohio State to turn the page and start over. In the seven years between his arrival and his retirement, Meyer did at Ohio State what he did at Florida and Utah and Bowling Green before that – he won. A lot. Meyer’s record at Ohio State puts him in the same class as Buckeye coaching legends like Tressel and Woody Hayes, perhaps even above them all. In just seven years, Meyer compiled an 82-9 record (with an astounding 90.1 winning percentage), three Big Ten titles, an undefeated season, one national championship, and a never-before-seen, perfect 7-0 record against Michigan. Although Ohio State has been on the outside looking in the past couple years with the playoff, Meyer has made good on winning big bowl games against top level competition. He did it in last year’s Cotton Bowl against USC and he also did it in a highly anticipated matchup with Notre Dame in the Fiesta Bowl after the 2015 season. Ohio State was dominant and it’s a wonder how a home loss to Michigan State upended their bid for back-to-back championships. With Meyer unbeaten against Michigan, Penn State and Michigan State emerged as Ohio State’s toughest rivals this decade with both schools notching important wins over the Buckeyes. In 2014, Ohio State made their customary primetime trip to Happy Valley and notched what was one of the toughest wins of the Meyer era. J.T. Barrett scored two rushing touchdowns in overtime and Joey Bosa secured the win with a walk-off sack. The unbeaten streak to start Meyer’s tenure in Columbus extended through the 2012 and 2013 regular season and ended at 24 games, a school record. The last of which was arguably the closest Michigan would ever come to beating Meyer before ultimately falling short. Carlos Hyde rushed for 226 yards and the Wolverines missed a two-point conversion for the win in the final seconds thanks to Tyvis Powell’s game saving interception. Nobody knew what to expect with third-string quarterback Cardale Jones taking over from J.T. Barrett heading into the Big Ten Championship Game in 2014. The Buckeyes had to make a statement to move up the rankings and make the Top 4 in the first year of the College Football Playoff. But could the QB who was best known for a tweet about playing school lead the Buckeyes to the promised land? Yes. And then some. The Buckeyes destroyed Wisconsin with Jones throwing for three touchdowns and Ezekiel Elliott running for 220 yards and two touchdowns. The statement was made and OSU was into the playoff. The biggest comeback in Meyer’s time in Columbus came in another epic contest against the Nittany Lions. Ohio State rallied from a 35-20 fourth-quarter deficit to win by a point. It was J.T. Barrett’s finest hour as a Buckeye as the record setting quarterback finished the game with an incredible 13-13 performance in the fourth quarter. Ohio State and Michigan met in a de facto elimination game in 2016 in the biggest stakes in the rivalry game in a decade since they met as #1 vs #2 in 2006. The game was an instant classic with the Buckeyes winning in double overtime thanks to a Curtis Samuel touchdown run. Of course, what might be remembered more is J.T. Barrett’s fourth-down run and the measurement that Jim Harbaugh took exception to. It’s easy to forget the 2012 season, Meyer’s first at Ohio State, because the Buckeyes were in the midst of their one year postseason ban after Tressel’s forced exit. Believe it or not, though, it was Meyer’s only unbeaten season at Ohio State. The Buckeyes capped it off with a win over arch-rival Michigan, shutting the Wolverines out in the second half and getting 146 yards on the ground from Carlos Hyde. It was an improbably quick turnaround after a 6-7 season the year prior and it was just a taste of what was to come in Meyer’s dominance in the rivalry. Ohio State’s victory over Oregon in the first-ever College Football Playoff championship capped one of the most improbable, incredible three-game runs that any school has ever had. Cinderella QB Cardale Jones threw and ran for a score, but Ezekiel Elliott was the star with 246 yards and four touchdowns. Meyer came to Columbus to win a national championship for the Buckeyes and he certainly delivered. Meyer’s final game against Michigan put the capstone on his unparalleled run of dominance in Columbus. In spite of Michigan being favored in the rivalry for the first time in a long time, the Buckeyes put up a historic performance in smashing the Wolverines once again. Ohio State demoralized Michigan by scoring the most points ever scored in the rivalry, putting 62 on the board. Meyer clearly knew he was going out on top, the only coach in program history to put up a perfect record against the Wolverines. At least on the field, it was the performance that best symbolized his time as Ohio State head coach. It shouldn’t make sense that Meyer’s biggest win at Ohio State didn’t come against Michigan, nor that it came in the National Championship Game. But ask any Buckeye fan what Meyer’s biggest win was and they’ll tell you it was the 2014 Sugar Bowl victory over Alabama in the national semifinals. This was the one that meant the most. It was the mythbuster. For a decade Ohio State had to live in the shadow of the SEC, a myth Meyer helped build back in 2006 when his Florida team ran all over the favored Buckeyes in the BCS title game. It’s why Meyer was brought to Columbus – to raise Ohio State and the Big Ten to that level where they could compete with the SEC. And in spite of being a significant underdog, Ohio State stood toe-to-toe with the preeminent dynasty of the day in Alabama and beat the Crimson Tide head-to-head. Ezekiel Elliott’s 85-yard fourth-quarter touchdown run was the signature play in Meyer’s signature win.